Internationally known for his agricultural practices in Virginia, Joel Salatin calls it like he sees it—and there’s a lot he’s calling out. 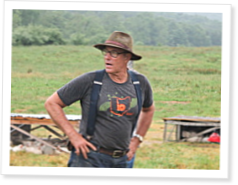 Joel Salatin is possibly the most influential farmer in America. He doesn’t work for the U.S. Department of Agriculture. Calling himself a “lunatic,” he’s most famous for his central roles in Food, Inc. and The Omnivore's Dilemma, as well as several speeches on the TED stage. Salatin abhors many commercial farming practices, concerns himself with “the pigness of the pig” and says the “organic” label is a scam. They’re also the people in charge of food labeling, and according to Salatin, the “organic” label just ain’t what it used to be. What Should We Eat—and Why? Gary Taubes and NuSI aim to correct a decades-old problem by telling the world what to eat—and backing the recommendations up with real science. Marty Cej reports. I love Joel Salatin! I applied last year for the summer internship for this year but didn't get excepted. I'm hoping to get down there in September for the Farm To Consumer Legal Defense Fund, fund raiser. Great article. Crossfiters need to learn that food quality is more critical than both Paleo and The Zone. I really wish this article weren't so hard on the "organic" label. Clearly labeling foods "organic" provides a valuable method of quickly and clearly identifying items that are more expensive than the items next to them. Richard- I'm not sure I understand your comment. Are you saying the article isn't true? Or simply that you "wish it weren't" true? The label is only valuable to the extent that the term has meaning. I think the article is pointing out that the term - as it is defined by government - doesn't mean what you or I (or the average consumer) think it means. I don't think the label "organic" is supposed to be a price identifier - but it has become that as much as, or more than, anything else. Fascinating article. Makes me wonder how we can find local farmers for those of us who live in more urban areas. Is big farma the only answer for large population centers? Interesting questions, to me. Great Article! and Dale I think (I might be wrong) that Richard was speaking tongue in cheek. $30 per person, 100 people/day. That $15000/week for 5 days/wk. $60,000/month just from tours. If every small farmer could make money like that then many more would be able to be more sustainable and slow down the process. He's making a killing off city folk. When I visited it was free. Of course this was 5 years ago, and I left with a cooler full of delicious meat. If he didn't charge anything it would become a burden on the farm. I had the chance to go to a two day seminar on Polyface Farms 7 or 8 years ago. It was great to see how the farm was run and talk with the interns about what they'd been doing and learned while there. This was also the time where I got to see what it meant for cows to, "kick up their heels and run," when their fence was opened up and they got to move onto the next grazing spot. As to the tours, Polyface Farms only offers them twice a month, so they're hardly making a killing on them. They also have an "open door" policy where anybody can visit at any time and look at any part of the operation with no charge. Moneywise, the last time I looked, Salatin was estimating that he was making $10-15,000/acre/year used for chickens and around the same for beef. 100 acres in use would gross $2-3,000,000 a year. That definitely enough to keep a small farmer in business even with costs. Finally, like Nathan, my wife and I left a freezer full of the best beef, chicken, pork, and rabbit that I've ever had before or since. Maybe wagu beef, but it's a close call. The meat simply tastes like it should.